Click on "Mosque Yard" or choose a different area of the building. Click on the 360 icons to explore, then click on the camera icons for more pictures and information. Zoroastrianism is one of the oldest religions in the world. This monastery is in Nepal, a country that borders India. The Pope is head of the Christian Roman Catholic church. How many times do Sikhs pray each day? Shinto is a religion practised in Japan. Krishna is believed to be an avatar of Vishnu. Click on the playlist to find out more about Muslim beliefs. Click "Next" to browse photos or choose another topic in the Image bank on the right. In the clip, the men wearing orange robes are Buddhist monks. Click on "Christianity", "Buddhism", "Hinduism", "Judaism", "Islam (Muslim)" or "Sikhism". Choose an answer. If you get it wrong, click on "Retry". An insightful look at the beliefs, history and customs of the major world religions. 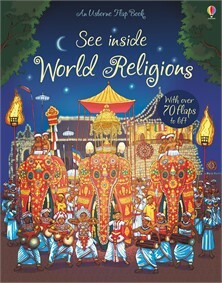 With over 70 flaps to lift, readers can discover key facts about each religion, differing ideas about God, worship and prayer and colourful festivals and celebrations. Includes Quicklinks to websites with video clips that bring each religion to life. The book is an engaging introduction to the beliefs, history and customs of the major world religions… A very lovely addition to your child’s personal library or a delightful gift; a must for a school or public library.